from the web container filter to a bean in Spring web application context. DelegatingFilterProxy is essentially a dumb filter and implements no logic. Its sole responsibility is to delegate the Filter's methods through to a bean which is obtained from the Spring application context. This enables the bean to benefit from the Spring web application context lifecycle support and configuration flexibility. This bean must implement javax.servlet.Filter and it must have the same name as that in the filter-name element. DelegatingFilterProxy is actually connected to a FilterChainProxy in the Spring application context. "The namespace element filter-chain-map is used to set up the security filter chain(s) which are required within the application. It maps a particular URL pattern to a chain of filters built up from the bean names specified in the filters element. Both regular expressions and Ant Paths are supported, and the most specific URIs appear first. by the filters attribute will be applied to that request. The filters will be invoked in the order they are defined, so you have complete control over the filter chain which is applied to a particular URL." copy and paste again from the official documentation which gives very good information on the lifecycle aspects. methods through to the underlaying Filters if such methods are called against FilterChainProxy itself. no matter how many times it is declared in the filter chain(s). By default this property is false and servlet container lifecycle invocations are not delegated through DelegatingFilterProxy." soon get back to hands on stuff. So far we have been quick to setup Spring Security and apply it in our application. But behind that minimal configuration and non-invasive behavior lot has been happening behind the scenes. It is time to uncover the activities under hood, draw some diagrams to understand the framework and move ahead in style. I will not draw out all the balls from the magic box now. Instead will slowly take out one ball at a time to make it slow and easy to comprehend and assimilate. There is a lot to learn and understand with this namespace configuration - <http&gt. So it needs a be enjoyed slowly like a good whisky. You must have already understood that Spring Security is based on servlet filters. This is what the official documentation says - "Spring Security's web infrastructure is based entirely on standard servlet filters. It doesn't use servlets or any other servlet-based frameworks (such as Spring MVC) internally, so it has no strong links to any particular web technology. It deals in HttpServletRequests and HttpServletResponses and doesn't care whether the requests come from a browser, a web service client, an HttpInvoker or an AJAX application. Spring Security maintains a filter chain internally where each of the filters has a particular responsibility and filters are added or removed from the configuration depending on which services are required. The ordering of the filters is important as there are dependencies between them. " Just to extract the keywords - irrespective of the source of http request the intercepting filter (configured as a delegating filter proxy in web.xml) hands over the actual security processing to a filter chain configured internally or Spring web application context. The request passes through each of the internal filters and is processed depending on what are the security requirements of the application or what customization has been done. Note you can very well introduce your own filter.Also note that the order of the filter in the filter chain is very important and there may be dependencies between filters in the chain. A filter coming later in the chain may depend on some data produced by filter coming earlier in the chain. I will dig deep into all these and also take indepth look into different filters that are available out of the box and also try to show the use of a custom filter in the chain. Since we used the new namespace based configuration, the required filters are automatically configured and no bean needs to be explicitly configured. But sometimes fine grained control is required (and these may not be supported in namespace based configuration). In this case it is very well possible to get full control over the filter chain and the filters. Now I leave you with a big picture of Spring security. In my next post I will to uncover more details about Spring security and its filters. I will blow out that yellow box more in the next post. As you have seen in my previous post the access to index.html was restricted. Whenever the user tries to access this page they were redirected to the login page. But this should not be case. The logical index.html page should be accessible to guest users as well as authenticated users. Turning this on is just a matter of configuration. This is shown in the modified spring-security.xml file. I have now added a new intercept url line. This line makes it possible to access index.html as a guest user. Now when you click on any link on the index.html page you will be redirected to the login page in case you have not signed in. proceeding to the next round of coding and adding additional features. 1> Add few more jars in your WEB-INF/lib folder. The current view of jars is shown in the figure below. This is the bare minimum configuration you need to do to get Spring Security started. This is a great relief for those of you who had worked with earlier versions of Spring Security or its ancestor Acegi Security. You had to explicitly configure the entire filter chain. That was tedious and very cumbersome leading to lot of errors and time and effort going down the drain. Thanks Ben and team for this good change. I will explain the different elements in this configuration in future posts as the intention of this post is to quickly get started with Spring Security as promised earlier. Step 3 - wire everything now in the web.xml. The modified web.xml looks like the one shown below. We have setup DelegatingFilterProxy which will look for a bean springSecurityFilterChain in the spring root web application context. The springSecurityFilterChain bean is setup automatically by the tag. The DispatcherServlet only has a specific web application context and hence you need to load the root web application context using the ContextLoaderListener. For now this listener only loads the security related beans in the root web application context. The ContextLoaderListener must be configured after the log4j listener if the later is used. ** By the way I am deploying on Tomcat 6 running on JRE 6. You will be redirected to a login page shown in figure below. This is a Spring security framework generated login page. Although the desired result is not what we intended (we donot want that the index page is accessed securily rather by all users and guests) but it is clear that Spring Security is up and running, integrated into our Spring MVC application. I will try to correct this in my future post.Also I will show how you how you can add a custom your application specific login page. Now let us supply the user id and password (jimi/jimispassword) and see what happens. You will be redirected to the index.html page. So it also suggests that Spring Security remembers what you tried prior to signing in. Thats all for today hopefully. If I find time between watching Indial Premier League and World Field Hockey Finals I will try to clarify a few concepts later in the day. Listing 1 - index.jsp 3> Add a controller for the landing or index page. Listing 3 - UploadController.java 5> Time to launch the browser and test it on the browser. 6> Click on upload photo, you will see it is accessible to any one. But only logged on users should be able to access that page. In the next post I will start with the first step to ensure that a user is logged in / signed in before he or she can access the upload photo page. Now I will add two more JSPs – one is the home page showing some dashboard information and the other is the file upload JSP which will be used to upload photos. Since the JSPs are placed under WEB-INF in any case no one can directly access it. So in the next post I will try to add a few page controllers to the scheme of things to make these pages accessible without any application security credentials. 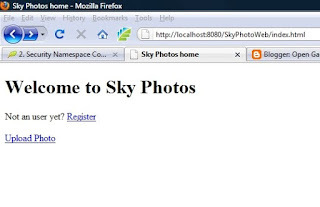 Now its time to code a bit in Skyphoto. So launch Eclipe and create a dynamic web project ready to be deployed on Tomcat 6. I am assuming that readers are atleast familiar with this. Next we will do a bit of configuration and throw in some Spring 3 jar files into the WEB-INF/lib folder. 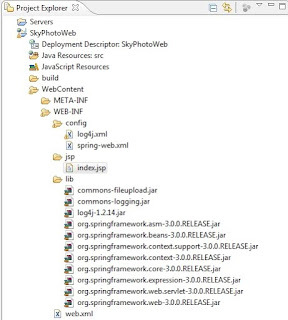 Step 1 - Configure Spring Servlets and log4j in the web application deployment descriptor. 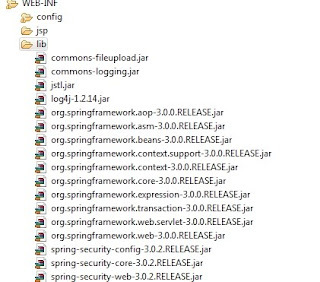 The log4j configuration will be very useful later to see all framework and application messages. I have set it to debug level to help understand the framework better. Finally here is a view of the Eclipse project shown in Figure 1. You can very well make out the jar files you need for the time being. Note 2 - donot forget to download Spring framework and Security security distributions from their respective websites. I am finally back to writing again after an absence of almost year and half. I will try to be more regular from now now. In this edition I will start with Spring Security 3. 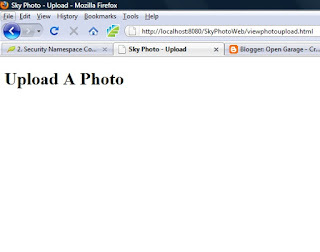 This will be a series of posts where I will try to build a very simple photo uploading and sharing service. This is actually my PoC with Spring Security 3. Spring Security unlike most Spring product portfolio is a not at all well documented. The tutorials available on googling are mostly outdated. Spring Security 3 certainly by look of things seems to be a very good feature rich product yet hefty beast. So here is my attempt to conquer it. In the course of this simple application development I will try to uncover most of the features of Spring Security. I will use Restful services support provided by Spring MVC so that I can expose a simple API for external applications which will consume the services of Skyphoto.